I can post comments again! I know how you feel about comparing yourself to other bloggers out there - my blog is not by any means successful in numbers but I have since come to realize that I enjoy blogging and it's not for the numbers. It's finding woman that are equally into clothes or connecting with people thousands of miles away. With that said, I have come to terms of my boring alley way background, no "magic" your lighting or my clothes being a bit boring. Always love blog and how you keep it real. And these photos are awesome! These pics are amazing Shanna and you look gorgeous. At the end we are all doing our best and that's all that matters. I just haven't figured out the practicality of taking blog photos during "magic hour." First, who in their right mind can do that in the morning? So that's a no-go. Then, the minute I come home from work I want to de-suit. And my husband wants to work out. So yes, we miss magic hour all the time. Don't worry about getting things perfect, just worry about being you and not getting caught up in the comparison game. Very nicely stated. I think that your priorities are just as they should be. We all struggle with issues of comparison, but it is nice to be reminded that we are not alone in this. And you husband is doing a fantastic job taking your photos. These are simply beautiful. Oh Shanna! Your photos are awesome and I love your blog - you are real and I love that your outfits are affordable and doable. Comparison is most certainly the thief of joy but I'll tell ya what, you have nothing to worry about. You look stunning in every picture and no one would know your pictures haven't been well thought out, etc. Your readers love them because we love you. At 46 I love your style and find my self reminding myself that as much as I want to look as wonderful as you do I am waaaaaay older! Ha! You inspire me anyway. Just keep the faith, your blog is special and I probably wouldn't enjoy it nearly as much if you had a professional photographer. I love blogs because I see real women wearing real clothing! I love what you do! You look incredibly stunning in these photos, Shanna! Ross needs to come give my and my hubby some lessons! ;) And I completely feel you on the comparison thing. Blogging can be such a hard balance, and comparison is a super-frustrating aspect of it! Shanna you truly are beautiful inside and out! I'm always so impressed that you come out with these amazing outfits and are a mom. Believe me you're exceeding the blogging craft! I love that you care so much. It seems a lot of bloggers these days aren't putting the thought into their posts and are just slapping things up to have something for the day. You are one of my style inspirations so keep up the FABULOUS work! I too sometimes get wrapped up in comparing my blog to others and it can really stress a girl out! I hope you can find that balance again of feeling like blogging is more fun than work. Something I think every blogger struggles with at some point! I haven't been feeling 100% on either - I think the summer makes it hard. I'd much rather be out doing fun stuff or lounging by the pool than blogging. But I still do enjoy it most days and I think that's what keeps us going. BTW, Ross NAILED it with these photos -beautiful my friend! Hang in there Shanna.....you are doing & looking your best ever! Just take blogging one day at a time...just like life! I think all of your feelings are really normal. So often we grow and put forth a better effort, but since we're living it we're not noticing it as much. It's also all about balance - no one should think you don't care or are not taking this seriously because you spent time in the summer living life with your family. And if they do think that way, you don't need them around. You are so right - what a busy schedule you have! 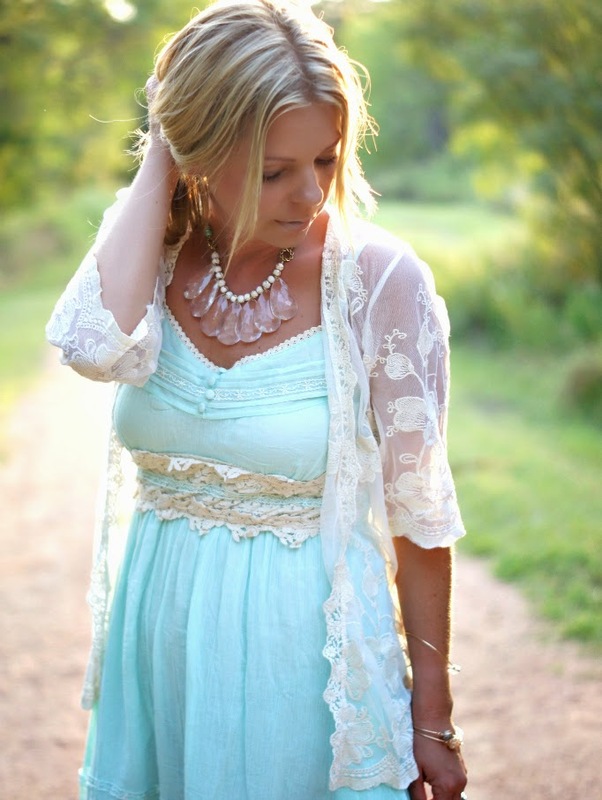 I love this outfit - the lace paired with the blue, and the necklace you chose! So pretty! Shanna, this is gorgeous! That blue/mint color is so pretty on you and I love the feminine details. I hear you about self critiquing. I am so guilty of this. The picture taking is a huge job and I get so frustrated when it doesn't work out - especially if the outfit is good (haha). BTW - I never once thought your recent pictures were sub-par. You always look so good. I can relate to this because we are backyard bloggers over here but these photos are stunning. Don't be hard on yourself - it's hard to do it all! These are seriously so of my favorite pictures of yours--you are glowing and that color is fantastic on you :) I also loved reading this post--it is def. not easy to be a blogger/perfectionist! I am a new blogger and my pictures are NOT where I want them to be, but its a reminder that they will get better and even FABULOUS bloggers like yourself have their own insecurities. You always kill it girlfriend. Shanna- I am a brand new blogger and your blog is one of my favorites! I am so jealous of your pics!! Honestly, your pics are why Ive only done old school style blogging and not fashion blogging yet! I said that to say, you're amazing and do an amazing job! I love your honestly though! You're beautiful! These photos are fab, golden hour is always the best time to take them! Don't be hard on yourself you are a great blogger, mom..etc! I loved meeting you at Lucky Fabb keep up the good work and embrace flaws you may think you have! These photos are so stunning and I LOVE your lacy cardigan! Aw, Shanna. I hope you know you are inspiring beyond your pictures. It's your authenticity, your voice, your ability to keep it real even though you have achieved that certain level of success (Hi, you've been in major publications!!) to which many aspire. I mean, the fact that you still take the time to make other people in the community feel important for what they do is more appreciated than you know. :) So please don't let those little voices get you down or keep you from doing what you do in a way that works for YOU. Your readers love you for YOU and not your lighting. I love your pictures! I think your husband does an amazing job and I love your blog! And that dress. I love that dress too! I have just discovered most of my comments aren't going through to you. Call me an airhead... I think it was something with my pop-up blocker. All that to say, I love your style and so enjoy reading your blog. I totally understand how you feel. I have actually just been posting about the same thing myself. Blogs are so amazing, but I have to remind myself that nothing is perfect and I cannot compare. You are beautiful! Thanks for sharing with us. Ah the comparison game... the thief of joy (I think I read that on pinterest somewhere...)! I do it all of the time. I totally bum myself out with "Look what they are doing" or "Look how great they look" and "look how tiny I am." And then I think "Why do I even do this??" I totally get you. It is tough. But you are amazing. You are one of the bloggers I totally look up to. I think you are amazing!! I definitely know how you feel. I compare myself way too much to other bloggers. It's so bad, but so hard not to do. I love these pictures of you, and the lace is gorgeous!! Love that necklace, very ladylike outfit! Haven't heard of Chicwish, definitely checking it out! I have those same boots. And I loooove that dress!? So beautiful. Love what you wrote. It's funny because I never considered myself to be one of those people who compare themselves a lot but I find myself doing it with the blog. I see people who started the same time as me working with brands I only dream of working with or having professional photographers work with them for free, etc etc etc.... it's hard to remind myself not to slide into that mode of comparing and like "what am i doing wronggg" haha but I try to remember the things I am doing right. It's funny because I always think your photography looks beautiful but everyone is their own worst critic! Well these are certainly gorgeous! I've had little luck with magic hour, I'm always at work or my Husband/Mom is at work when I'm off so my photos are usually in the middle of the natural, bright, mid-day light. I highly recommend tripod and a remote for your camera. I bought mine on amazon for really cheap, and then you don't need anyone around, you just set the timer! These are beautiful pictures! Fitting in blogging pictures is so important to me, but life is more important. So sometimes that means we aren't taking pictures at the best time of day. It is hard not to compare in the blogging world, but it is important not to in order to keep it fun. Keep up the great work!! These are such amazing pics of you!! Wish I could go to pretty locations too but with two very wee ones & no child care it's difficult. Your husband does an awesome job! Wow, you look amazing! I can definitely tell these pictures were taken at the "magic hour"! It made me laugh because you said that you used to take pictures in your backyard and that's totally what I do with my tripod :) Maybe when my son gets older I can teach him to take pics, LOL! I totally feel how you feel, not "feeling it. Not feeling that we always have the time, or feeling that we just need to relax. I think you are doing an amazing job, and I read everyday. No matter what is different from the next you always keep me coming back for more! You are such an inspiration! I've said it before and I'll say it again, one of the main reasons why I love your blog so much is because your extremely real! Your so relatable and I really enjoy reading whats on your mind. The way you voice your opinions in such an authentic way is truly amazing. You may try to compare yourself to other bloggers but in reality theres a lot of other bloggers that compare themselves to you! (Myself included) You have accomplished so much and have worked with some extraordinary brands! Your an amazing woman, Shanna, not to mention an extremely stylish one at that!! I have to LOL at the "magic hour" comment.. My magic hour is whenever I can actually go somewhere to shoot haha! Shanna please don't feel bad! I love your blog. I feel you on the blog photos and comparing myself. I am a newbie blogger and I already feel overwhelmed that I'm not pretty or tall enough or have better clothes or what not! I love the minty bluish color of the dress! Ahh the comparison game.. we all do it. It's human nature. But I think, scratch that, I KNOW that you are one of the best bloggers and most beautiful women (inside and out) around! These photos are gorgeous and your dress is beautiful. LOVE. I totally feel you! It is so difficult not to compare yourself to other bloggers. I was just comparing myself last night and then reminding myself not to do that. lol. But holy smokes, look at the gorgeous lighting in these photos! I think it's hard to shoot during the golden hour in the summer because the golden hour happens so late at night. I'm usually in my pj's by then. lol. These pictures are AMAZING! And like always I love how you share from your heart. Beautiful words, beautiful girl. The light is beautiful in your photos. 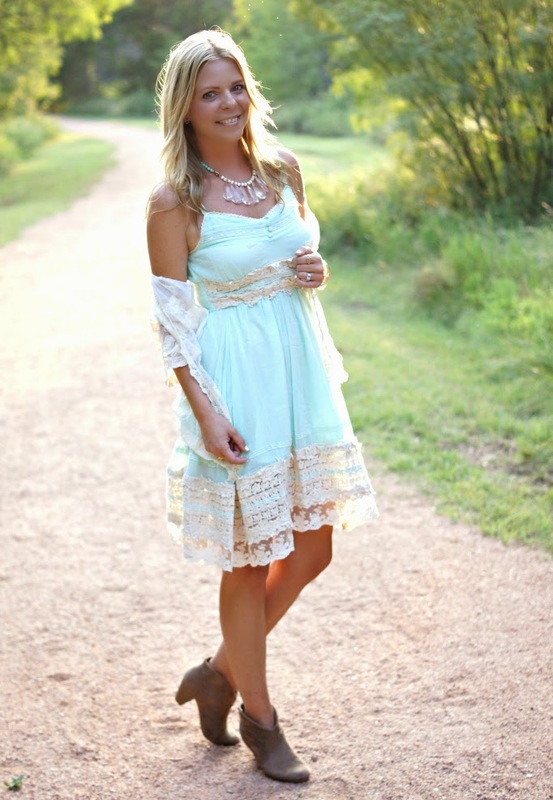 I love how dreamy that lace dress is!